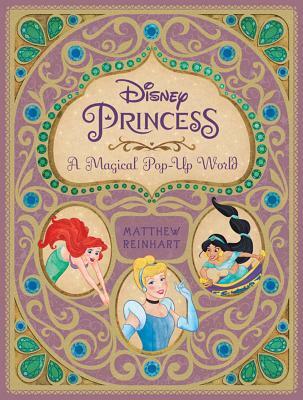 Starring the timeless characters that have made the Disney Princess films a treasured part of pop culture and animation history, this visually stunning volume is packed with intricately designed pop-ups, transformative scenes, and many other surprises. With state-of-the-art paper engineering and beautifully rendered illustrations, Disney Princess: A Magical Pop-Up World brings these castles and characters brilliantly to life, capturing the magical worlds that have enthralled audiences for decades. This collectible piece of Disney Princess magic spans eleven films and princesses, including fan-favorites such as Belle, Snow White, Ariel, and Rapunzel. Through twenty-seven pop-ups and transformative scenes, the key moments from these beloved films leap from the page, and the accompanying text makes this book a wonderful interactive reading experience that families will treasure. Join Cinderella as she transforms for the ball, Jasmine as she embarks on a magic carpet ride, Aurora as she pricks her finger on Maleficent’s spinning wheel and is saved by her prince, and Merida as she bravely fights to decide her own destiny. The ultimate pop-up for collectors, Disney fans, and kids of all ages, Disney Princess: A Magical Pop-Up World is an indispensable celebration of these enduring characters, stories, and fairy tales.